You’ve decided you want to keep chickens. That’s a great decision; chickens make wonderful pets, plus they provide you with food – what more could you ask for? And now that you know you want chickens, it’s time to start looking into what equipment you’re going to need. There are a few different things you’re going to need to get, but perhaps the most important of all, and certainly the one you’re going to need to spend the most time thinking about, is the chicken coop. After all, you want your new feathered companions to be comfortable and happy. Happy hens produce better quality eggs. Plus it’s good to look after your pets well, isn’t it? So finding the perfect chicken run is all part of this all-important process. Buying a chicken pen is a long term investment – with the right care and attention, regular coats of outside paint and wood preserver, your chicken coop can last for many years. You just need to check the roof felt, latches and bolts for rust and replace them when necessary. Everything else should be just fine. When you first get your chicken coop you’ll probably need to treat and paint it, so make sure that the wood treatment and paint you pick is definitely animal friendly, and make sure it’s completely dry before you put your chickens into it. 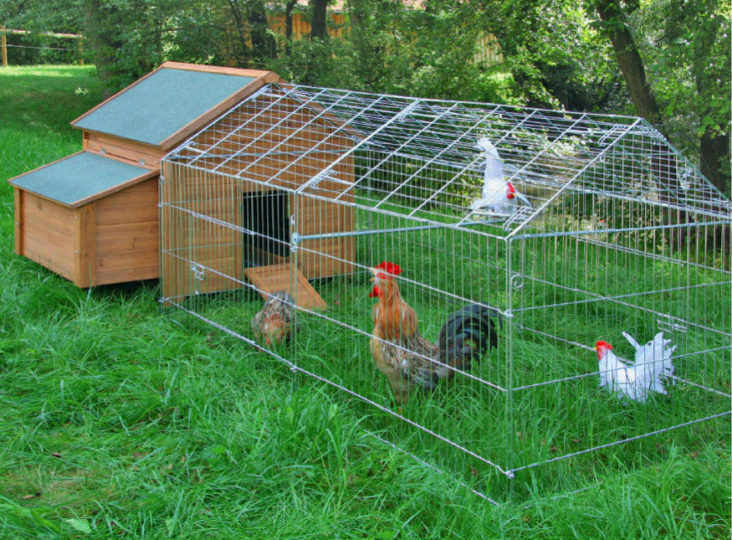 Here are what we consider to be the top three chicken coops for beginners. The Galvanised Outdoor Poultry & Pet Animal Pen/Run is ideal for when you have picked a chicken house and you want some additional space for your hens to run around in. One of the great benefits to this particular chicken run is that it can be attached to most pre-existing small chicken coops, but it can also be used as a stand alone pen which means you can change its location easily, every day should you wish to. This can be of great benefit to your chickens since it gives them new earth to scratch in and even a different view. This kind of pen also keeps your hens safe from predators, but they still have a lot of space to move about it, and they can get the fresh air that these kinds of birds need to thrive. Throw in some seed and they will be extremely happy with this particular set up. The run has three separate lockable doors, each one easily access through a handle and pin mechanism but that are entirely secure for your chickens (two of the doors measure 50cmx40cm, and the third is 40cmx30cm). The galvanised steel won’t rust, increasing the life of this chicken pen, and it is easy to put together once it is delivered. The Duck & Goose Coop/House is made from Cunninghamia pine, and comes already protected with a coat of wood paint, giving a shiny and attractive look as well as making it perfectly ready to sit out in the garden and keep your chickens safe. One of the major benefits of this coop (which can be used for all kinds of poultry, including chickens) is that it is extremely hard wearing and strong. Once it is put together, this sturdy chicken pen will be safe and secure for many years to come. Although this coop will protect your birds from predators, it also works against adverse weather. There is a special bitumen roof that keeps the rain out and the sun off, the there are plastic feet for the entire thing to stand on, meaning that the base does not get too cold or damp. The coop measures 93cm (L) x 73cm (W) x 67cm (H), so there is plenty of room for your birds to move around in. The rear ventilation holes make it supremely comfortable no matter what time of year it is. As chicken coop designs go, this is one that has it all. The Outdoor Small Animal & Poultry Enclosure comes in two sizes so you can choose either a small (70 x 80 x 128cm) or large chicken coop (220 x 102 x 160cm) depending on how large your outside space is, and how many chickens you are intending to keep in the coop. What’s fantastic about this pen is that it is made of lightweight softwood, but is still sturdy and strong, making it easy to put together and move when you need to, but also ensuring that it withstands the elements and any predators that may choose to attack. There are two areas to this pen; there is a sheltered part where the hens can sleep and stay warm and dry, as well as a run area where they can get the exercise they need to stay fit and healthy. Both areas have their own separate doors so you can easily clean your chickens out without disturbing them or giving them any chance to run out of the hutch, and there is a small set of stairs that connect the two areas, enabling your chickens to move freely from place to place. Any of these three chicken coops and pens will be suitable for your garden based birds. They are all sturdy and strong, and all will protect your hens from predators, and the elements. As to which one is best, that will depend on how many chickens you would like and what your budget is. Do your research and you’ll soon know which one will work for you, and your birds.